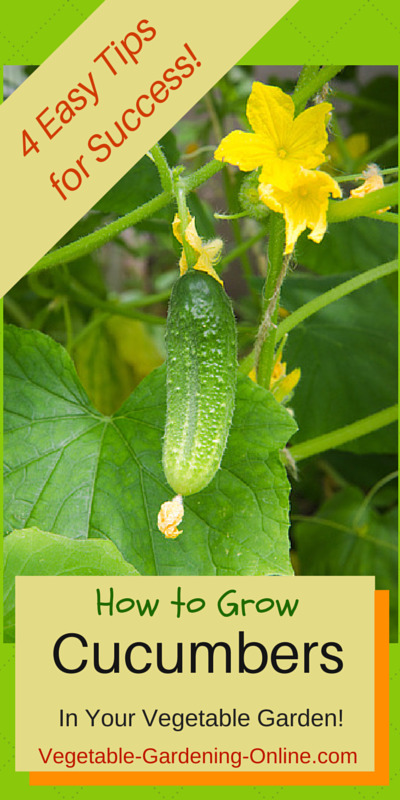 Use our 4 easy tips for growing cucumbers in your home vegetable garden! Adequate water is the secret to raising sweet delicious cucumbers at home. To save space try vertical vegetable gardening with cucumber plants using a trellis! 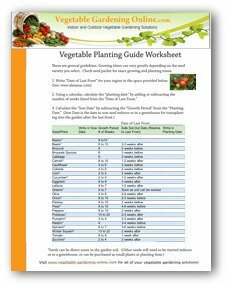 Download our free sample vegetable garden plans and worksheets for growing a great vegetable garden at home! 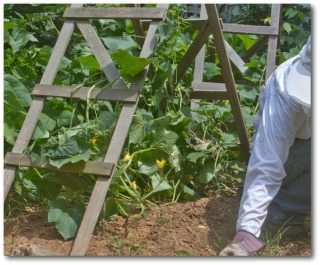 Planting cucumbers in a home vegetable garden is fun and easy. Even if you don't know how to garden, you will find it easy to succeed with cucumber plants. 1. 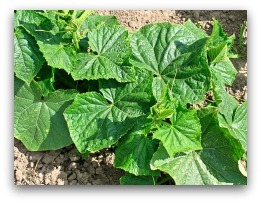 Cucumber plants are warm-weather plants. They are sensitive to frost. Freezing weather will kill cucumber plants. 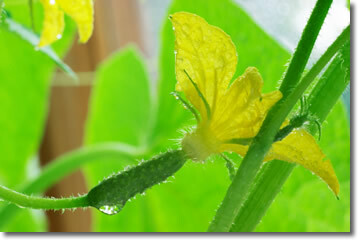 Don't plant cucumber seeds or transplants outdoors too early! Wait until danger of frost is past. If an unexpected frost occurs after you have cucumber plants in the ground, protect them with fabric, or plastic covers that will keep the air around them from freezing. 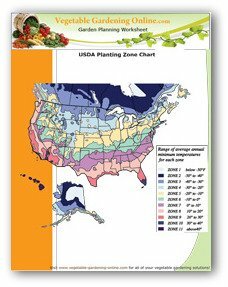 Use our free zone chart and planting guide above to determine when to plant your cucumber plants. 2. Choose a location with full sun to plant your cucumber plants. Cucumbers like warm weather, and lots of sunshine! 3. Locate cucumber plants near a convenient source of water, as they require frequent deep watering in order to not become bitter-tasting. See my grandmother's ingenious method below for providing extra water for growing cucumbers! 4. 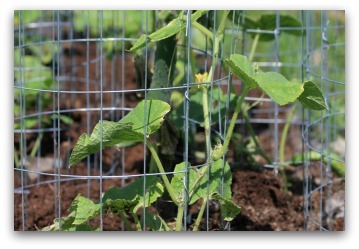 Use a cucumber trellis or wire cage when growing cucumbers to allow your plants to climb. This not only saves space, but makes it easier to find ripe cucumbers. Cucumbers tend to hide under the leaves, and by the time you notice them, might be overgrown and over ripe! Cucumber plants grow quickly and produce their fruit quickly. Soon enough, you’ll have a bumper crop of cucumbers for your salads and pickles! With just a few feet of space in the backyard, you can grow these delicious and nutritious vegetables by training them to grow upward on a trellis. This is a form of vertical vegetable gardening that will save a lot of space in your garden. anything else that the cucumber tendrils can grab hold of to climb. Using a cucumber trellis makes harvesting cucumbers a bit easier. It easier to find the cucumbers, and to pick them. It keeps the growing cucumbers off the ground, so they will also be less exposed to pests and diseases. Growing upwards on a trellis helps to create shade for the cucumber plant so that it doesn't get so stressed during hot weather. Your cucumber plant will stay healthier when you use a trellis. If you have plenty of room in your garden, you can let the growing cucumbers sprawl on the ground. This will require considerably more space, as many cucumber varieties will spread 6 or 8 feet in diameter. 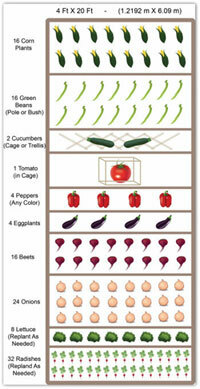 On a smaller garden plan such as this, it is best to use a cage or trellis to allow cucumbers to grow upwards. This will save lots of space in your garden for other plants to flourish. Some varieties of cucumbers also make excellent container plants. 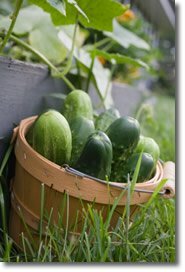 Be sure to install your cage or trellis in the pot as soon as your cucumber is planted. 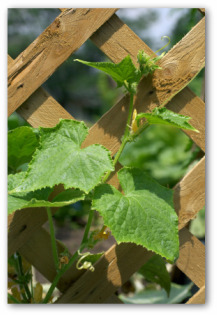 If you wait, it will be difficult to train the cucumber vine onto the trellis without causing damage to the vine. 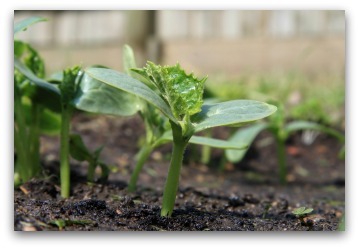 When planning your vegetable garden layout, there are a few things to keep in mind. You can, however, pickle both the slicing and pickling types when the cucumbers are picked while still small. Although there are two ways of planting cucumbers – direct sow and transplant method – you are sometimes better off with direct sowing, as care is needed not to disturb the roots when transplanting. To save time, however, small plants can be purchased or started in pots to be transplanted at the proper time. When looking for the best spot to grow cucumbers, look for loose, warm and nutrient rich soil such as humus. 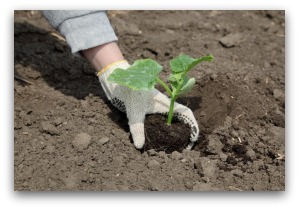 Prepare soil to a depth of 8-12 inches, for roots to have plenty of room to grow. Ensure that the area is well-drained as cucumbers will not thrive in constantly wet areas. If you plant more than one cucumber plant, they should be at least 4 to 5 feet apart to ensure good feeding and to allow some space to walk between the vines. Also, you might want to consider trellises made of metal or untreated wood to train the vines upwards in a vertical garden to take less space. If your soil has not been enriched with humus or compost, you may want to use some fertilizer. 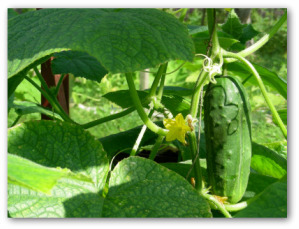 Cucumbers are a quick-growing plant, so it is important to supply water and nutrients throughout the growing season. Before planting the cucumber seeds, you have to determine that the danger of frost has passed, as cucumbers are a subtropical plant and require relatively warm temperatures. When the warm soil is ready, you can make small furrows an inch deep into the beds and drop 3-4 seeds in each hole. Completely cover the seeds with soil although you must not pack it too tightly. Tiny cucumber plants are easily damaged during transplanting. Therefore, if you have time, it may be wise to start growing cucumbers from seeds. But if you decide to purchase small plants, try to find them in bio-degradable containers that can be planted directly in the ground without disturbing the little plants. After planting the seeds or small plants, the process of growing cucumbers gets easier. You just need to keep the plants weed-free and well-watered. Water more frequently when the plants are small, as the root system is near the surface and will dry out quickly. Applying mulch around the plant can help retain moisture and prevent weeds. As the plants grow larger, frequent and deep watering is best. How to Prevent Bitter Tasting Cucumbers? It helps to select cucumber varieties that are not prone to bitterness. However, if your cucumbers taste bitter, it is likely because they did not receive enough water. Cucumber plants seem to need more water than the rest of the garden plants. 1. Take a one gallon can, making holes all around the bottom of the can with a pointed can-opener. 2. Bury it in the ground next to the cucumber plant. 3. Use the garden hose to fill the can with water several times a week. This worked well to give her cucumber plants extra water without over-watering the rest of the garden. Also, because the can is buried, and the holes are in the bottom, the water is released deep in the ground where the thirsty cucumber roots have access to the water. This watering method also helps prevent mildew from damaging your plants. Cucumber vines are susceptible to powdery mildew if the vines are often wet overnight. Be sure to water in the morning, so the foliage has time to dry completely before nightfall. 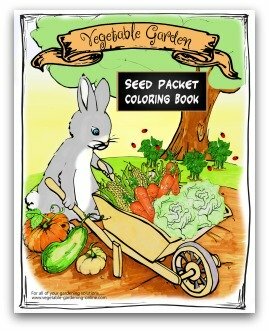 We have added some new fun coloring and activity sheets for children, which include growing cucumbers! 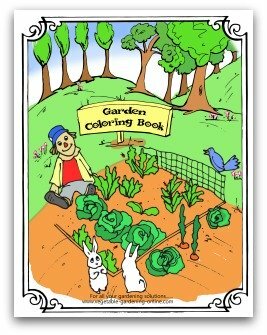 We will be adding gardening bookmarks, mazes, puzzles, and more fun pages for moms and teachers to use with their kids. Get them started loving gardening and their vegetables, and they will never regret it! We will be adding more activity pages for kids in the next few weeks, so check back often to see the latest fun projects for little gardeners!